Article written by Highlands County Master Gardener Volunteer: Charles Reynolds for publication on October 8th, 2017 in the Highlands Today Newspaper. Florida lawns may go into a form of dormancy during the winter but there are several things the homeowner can do to help the turfgrass make it through the winter and spring to life, so to speak, when warm weather arrives. There are even tricks to having a green lawn all through the winter that will really impress your neighbors, for better or for worse. The first thing is to give your lawn a good feeding before the cold weather gets here. The University of Florida recommends not fertilizing after October. It won’t hurt the lawn if you fertilize after October but grass is going dormant and the fertilizer will just go past the roots and into the water table. If your soil has enough Phosphorus, try to keep the Phosphorus content low as well, (the middle number on the bag label). If you forget to fertilize in the fall, don’t worry about it, just apply the fertilizer in the early spring when the grass begins to grow again. 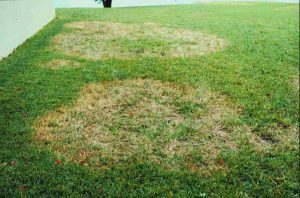 Centipede grass and St. Augustine grass are both susceptible to Large Patch lawn disease, a big round patch of dead grass, in the early fall. This is a fungus that thrives during cool nights. Apply water early in the day to avoid long periods of leaf wetness, also try to keep the nitrogen content on your fertilizer low (the first number on the label). Persistent bouts of Large Patch may require a fungicide application. Now about that green winter lawn. Overseeding, or sowing another grass seed over your lawn is an option. As the St. Augustine, Zoysia, and Bahia varieties go dormant, spreading a cold-hardy annual rye grass on top of these perennial grasses will give you that green lawn all winter and to top it all off, the annual rye grass dies once temperatures get up into the 80’s and 90’s at night. Then you have a ready organically-rich compost already in your lawn. How cool is that? The downside is you’ll have to keep watering, fertilizing and mowing your lawn all winter. 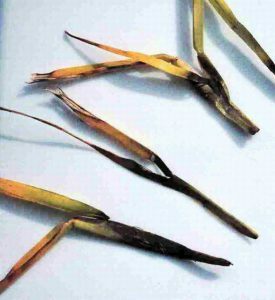 Be sure to keep the rye seeds watered until they germinate. There is another way to have a green lawn guaranteed, and that is paint. Or as they say in the lawn care trade; turf colorants. These are green dyes usually used on athletic fields and golf courses but are available by some lawn care companies. These dyes are presumably environmentally ok. I strongly recommend not going to the hardware store and buying five gallons of house paint and spray-painting your lawn to color-coordinate it with your house. For more information on lawncare and any other gardening issue, contact your local Master Gardener help desk.